With hundreds of people with disabilities on the waitlist for their new companions, we are working hard to build the capacity of our life-changing program. We invite you to join us as a Community Supporter of this powerful program through our Give a Dog a Job® campaign to help us achieve our mission. Your support will help Canine Companions® match more teams than ever before, offering expertly trained assistance dogs and a lifetime of support to people with disabilities – at absolutely no charge to the recipient. Joining Canine Companions® as a Community Supporter is an easy way to build your business while helping to change lives. Animal lovers are a passionate audience who believe in our powerful mission. Association with Canine Companions can enhance your reputation, increase customer loyalty and drive traffic. There are just a few simple steps to becoming a Community Supporter of Canine Companions. 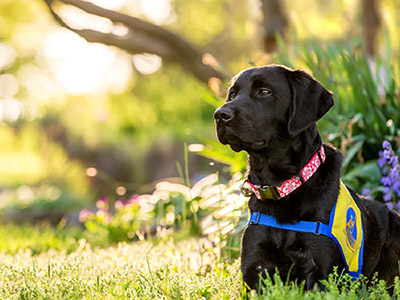 When you pledge to make Canine Companions your charity of choice to help provide exceptional dogs for people with disabilities, you’ll receive our step-by-step guide for the Give a Dog a Job campaign. This guide includes easy to use tools such as turnkey marketing and public relations materials as well as photos and stories. It also includes a variety of digital and in-store assets, and you can choose what works for your business. From start to finish, you’ll have everything you need to make your campaign a success.